Long before my husband Greg and I began planning our first trip to France, perhaps even before I had started sketching four years ago, I had looked at paintings and sketches of the Eiffel Tower with complete awe of whomever had attempted its image. How intimidating it must be for any artist to stand before such a classically elegant structure, one that has been so overly depicted by the media in the past couple of centuries that it may be one of the most easily recognized icons in the world. 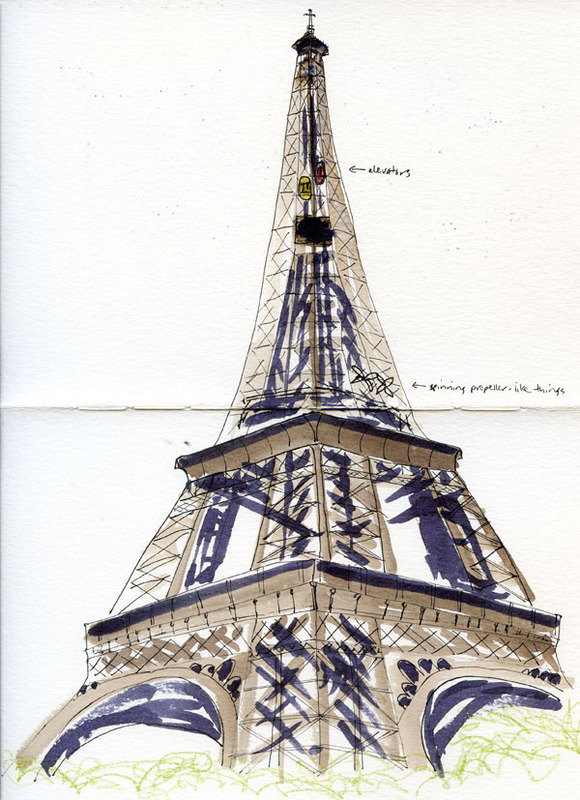 Its proportions and shape are well-known even by people who have never been anywhere near Paris. What reckless chutzpah must be required to pull out a sketchbook in its shadow! On a cold, drizzly day in May, I stood in that very shadow of La Tour Eiffel. Reckless chutzpah? Perhaps. Or maybe it was just that there was no way I was leaving Paris without it! The drizzle was threatening to turn to solid rain; I had no time to dawdle. Whew! With that out of the way, I could proceed to sketch as much of the rest of Paris as I could in four days! 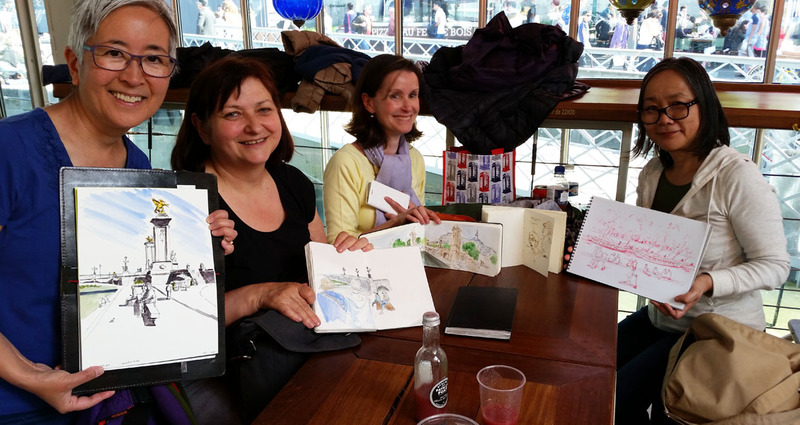 By far the highlight of my short stay in Paris was getting together with Urban Sketchers Paris at Les Berges on the Seine River. 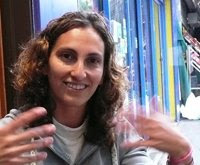 The event turned out to be an international one: Participants included Sigrid Albert from Vancouver, B.C. (whom I had met when she visited Seattle a couple years ago), and Brinda from India, both of whom happened to be in Paris, too. 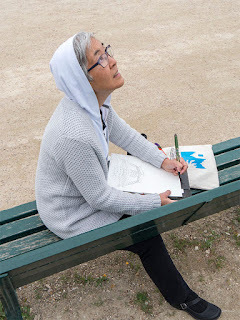 (One thing I love most about being part of Urban Sketchers is the international network you automatically join and can connect with anywhere in the world!) 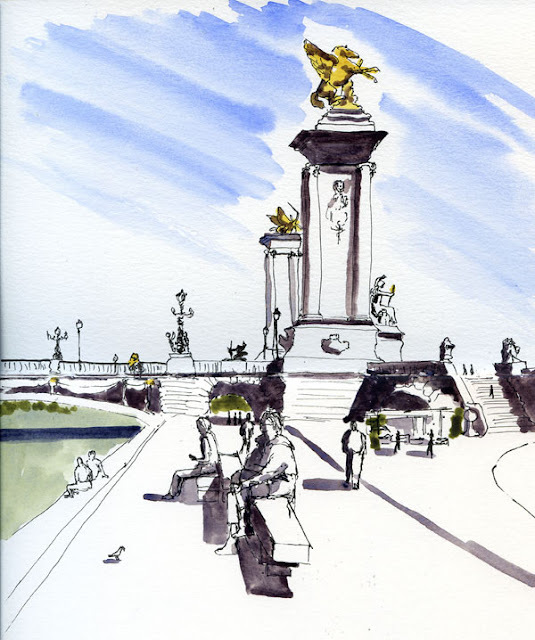 Under a clear blue sky and temperatures warm enough to take off a layer or two, I sketched Pont Alexandre III, the wildly ornate bridge that spans the Seine. Our next stop was Sarlat-la-Canéda in the Dordogne River valley. 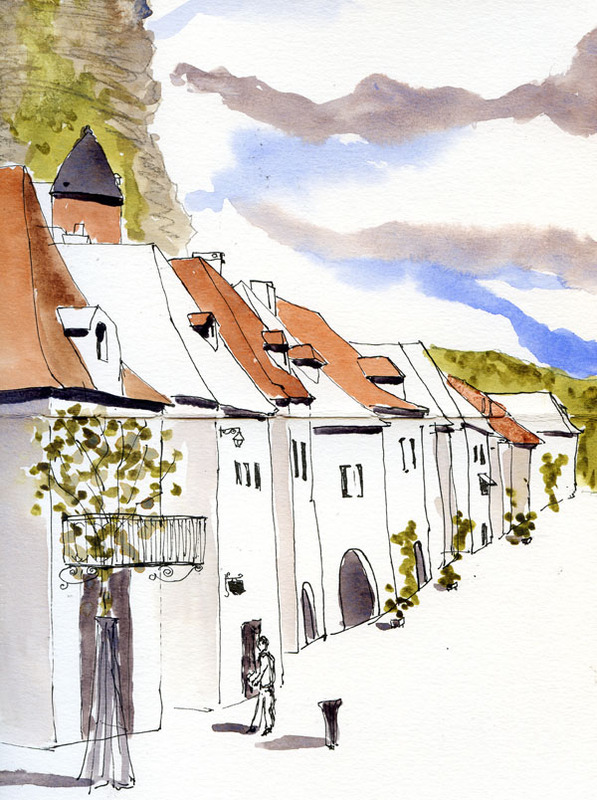 As far as sketching subject matter goes, architecture really isn’t “my thing.” But old Sarlat-la-Canéda is filled with an architectural style that even I adored sketching. The relatively simple lines, steep roofs and just enough run-down crookedness made the buildings less intimidating to capture. 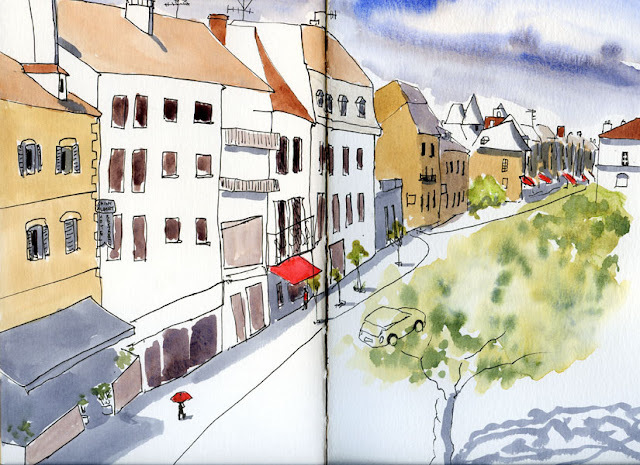 The rain and cold (45 F in the mornings) made it hard to sketch much outdoors, but our hotel room window looked out on a charming street that I sketched happily and comfortably indoors. From Sarlat, we took a day trip to picturesque La Roque Gageac right on the Dordogne River. Again, I was smitten by the storybook architecture in this small village. Famous for being the home of Van Gogh, Arles wasn’t even on our initial trip-planning radar; our intention was to go directly from the Dordogne region to the south of France. Getting there by a series of non-high-speed trains, however, would have meant a very long, grueling day of travel, so we started looking at stops along the way. 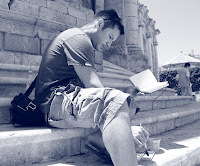 Small yet full of ancient Roman history, Arles on the Rhône River struck our fancy. Van Gogh knick-knacks aside (I decided to forego the plastic placemat reproduction of “Starry Night”), Arles is a fascinating town of ancient Roman artifacts. 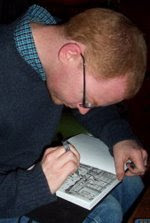 I think I spent the least amount of time sketching in this city compared to others because I spent the most time simply taking in its history. The Amphitheatre Arenes was an especially challenging sketch subject: How do I choose how much of it to fit onto a dinky sketchbook page? I don’t think I came close to indicating its vastness, but I have fond memories of sweating instead of shivering as I sketched! Yes, we were finally in the warmer southern end of France! Our final stop in France was Villefranche-sur-mer, a small resort town a short train ride from Nice. 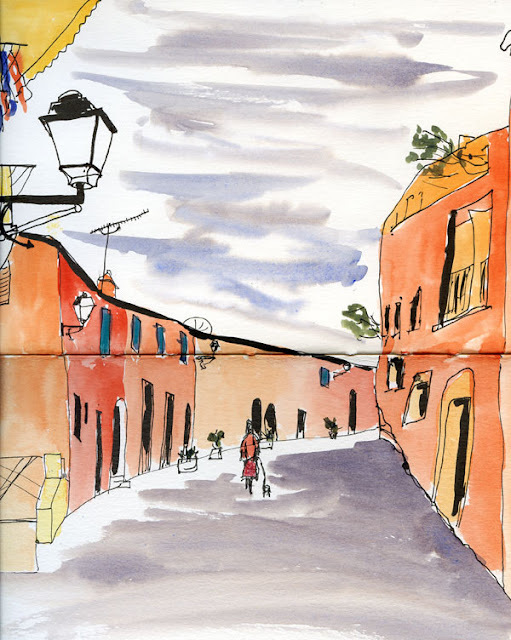 Unlike Nice’s shiny glamour, Villefranche is a charming village with crooked, narrow streets. It has a slow, sleepy quality (except when a cruise ship is in town!) that is just our pace. The pastel-colored buildings, palm trees, lovely beach on the bay and warm sunshine all made me feel like we were not just traveling but on summer vacation at last. 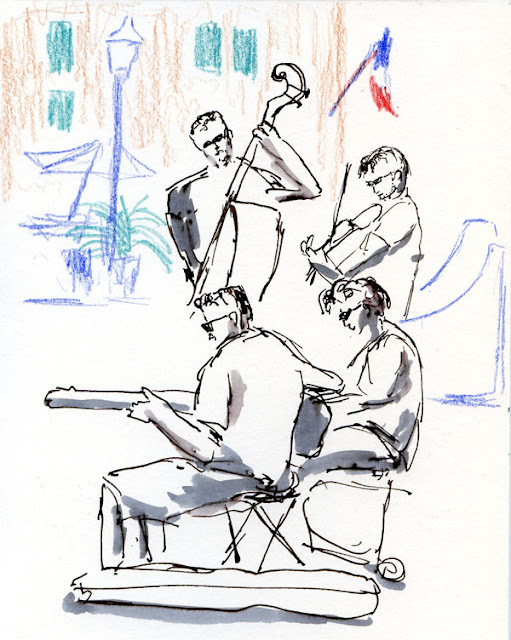 There, we could finally relax at outdoor café tables and enjoy the music of street performers. It was the perfect end to a wonderful two weeks (and we have a long list of things we saved for the next time we visit France!). 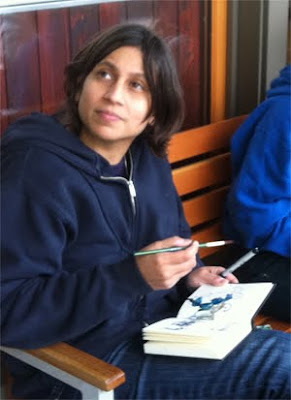 Tina Koyama is a Seattle native and active member of Seattle Urban Sketchers. 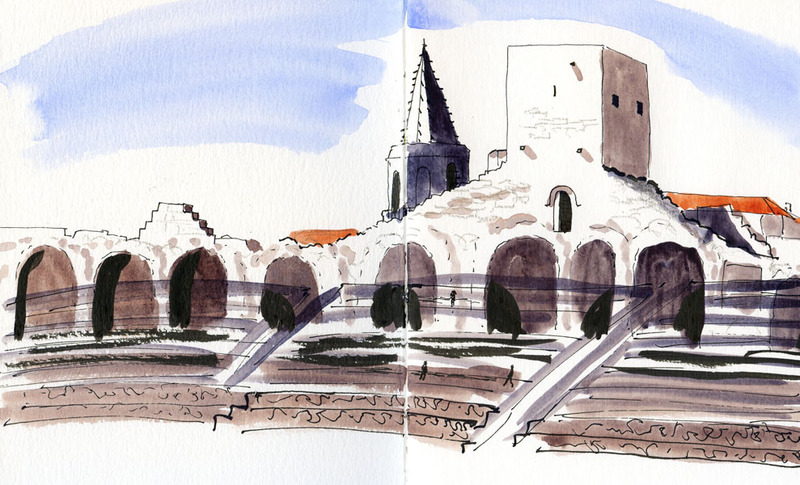 To see more of her sketches and photos from her trip to France, please see this Flickr album.